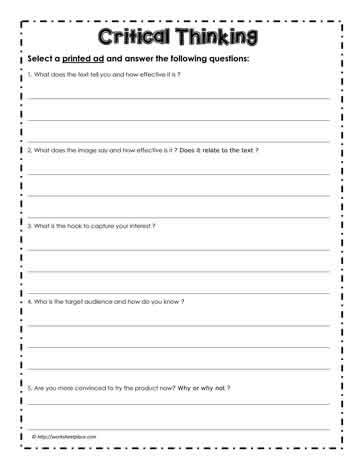 This media literacy worksheets asks students to look at a printed ad either from a newspaper, the internet or a magazine. It asks that they look critically to see what information is missing and what the strategies are that are used to grab the reader's attention. Promoting critical thinking through advertising ads is an excellent method to get students using their higher level thinking skills. Critical thinking refers to the ability to think critically about what is seen and or read. Predicting and inferring are great strategies to support critical thinking. For media literacy, ask students to predict how well the ad will perform and then ask them why or why not. Inferring refers to read between the lines. What is the hidden message in the ads?